A Wrinkle In Time is about family, love, teenage troubles all wrapped up in a fantasy space travel movie. It’s great movie for teens, but keep reading to find out why it might not appropriate for younger audiences. 13 year old, Meg, and her genius brother travel through space and time to rescue their missing father with the help of some friends. Even though she goes on a literal journey to find her dad, she also goes on an inner journey that addresses the feelings and situations that a typical jr high aged teen goes through today. And in the end, she learns that love and family are some of the most important things. The book and the movie have a great moral lesson. I have to be honest and let you know that I haven’t read the book; however, my 13 year old daughter read it about 4 months ago. She was not a fan of the book, but we decided to go see the movie anyway. I questioned my daughter about the movie versus the book. Even though she didn’t enjoy reading the book, she felt the movie did not do the book justice. A Wrinkle in Time is definitely for older children, pre-teens and teens probably. There are a several very intense and scary scenes, plus there is a lot of science discussion that could easily frustrate younger children. Heck, my brain hurt trying to figure out what they were always talking about. As always, know your kids or see it first if you have any doubts. There were no extras during or after the credits. 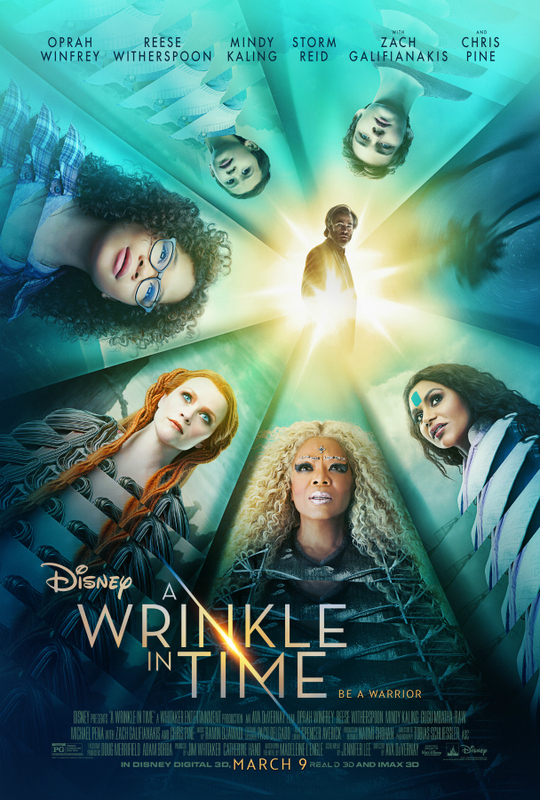 A Wrinkle In Time opens nationwide Friday (3/9/18).